. : HI432: Modern Japan--course syllabus :. "Go ni irite wa, go ni shitagae." The goals of this course are threefold: Modern Japan is designed (1) to provide survey knowledge of Japanese history from the late Tokugawa period through the present day; (2) to cultivate familiarity with a non-Western culture; and (3) to develop your proficiency as an historian by fostering (a) an empathic perspective and (b) the academic skills of critical reading, thoughtful analysis, systematic research, persuasive writing, careful listening, and effective oral presentation. Modern Japan Sourcebook, Volume I. 2012. Can be downloaded here in iBook format or here as a PDF. These texts will be supplemented by other readings, to be distributed as handouts or electronically. Some of the readings for the course are challenging, but they have been selected carefully for the contributions they offer to understanding Japanese history and society. Some of the proper names you encounter will be referred to in the tradition of the native land. That is, Japanese names are presented with the family name first, followed by the individual's name (e.g., Mishima Yukio). Foreign words that are not proper names or have not been adapted to common use in American English (e.g., sushi, samurai) should be italicized in your papers. This course will be orthodox in its presentation: in general, you'll read something before each class meeting, and in class we'll discuss what you've read--what I call "Socratic discussion." You'll be expected to write short yet demanding papers, take period tests and a final examination, and participate regularly in class. The few papers you write must follow the "empirical essay" format and use the APEC method of argument. If the syllabus doesn't say something to the contrary, then the paper is to be two pages long. That means one sheet written on both sides if you handwrite, or two fronts if you type or word process. If you use notes or bibliography, they may go on a separate sheet. In fact, you may always write as many pages as you want, but the first two will be read and graded. "Mt. 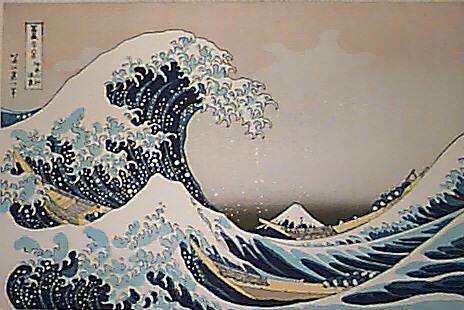 Fuji Between the Waves off the Coast of Kanagawa; One of 36 Views of Mt. Fuji"
No assignment. We'll spend the time in this class getting to know one another. The course syllabus and other course materials will be distributed. Be sure to read through the introduction to this syllabus thoroughly. 2. Land and People I: Geography. Read Gordon, pp. 3-9. At this point, don't get bogged down by the names and dates in the reading; instead focus on the general concepts. To what extent has Japanese culture been shaped by the geography of the home islands? By China's influence? Study the maps of Japan (including the one on page 294 of the Gordon text) so that you can identify the four main islands and the locations of major cities Fukuoka, Hiroshima, Kobe, Kyoto, Nagasaki, Nagoya, Osaka, Sapporo, Tokyo (Edo), and Yokohama for a geography quiz in class #4. 3. Land and People II: Race and Nation. Read excerpts from the Shinto creation myth and James Fallows, "The Japanese Are Different From You and Me," in the Sourcebook. Compare and contrast the story of the Sun Goddess with the Genesis account in the Judeo-Christian tradition or other creation myths with which you may be familiar. Note the connection between the legend of the Sun Goddess and the Japanese monarchy today. [Brownie points if you find out what the term caesaropapism means.] What are the connections between the Japanese creation myth and the modern attitudes Fallows describes in his essay? How do these attitudes differ from racism in America? 4. Religion I: Four Great Traditions. Read Chapter 2 in the Sourcebook. We will focus on Shinto and Confucianism in class. Think about how these religious traditions shape the contemporary Japanese cultural mindset. How do the elements of these traditions reflect the themes of rice culture and national/racial identity we've already discussed? Map quiz in class today. 5. Religion II: The Sound of One Hand Clapping. Read handout on Buddhism and Zen. This assignment focuses on Taoism and the roots and central tenets of Buddhism. We will narrow our focus today to an important and influential strain of Buddhism in Japanese culture: Zen, a pursuit which is fundamentally intuitional rather than intellectual. 6. Religion IV: Values in Modern-Day Japan. Read Thomas Rohlen, "Spiritual Education in a Japanese Bank," to be distributed. Consider how the bushido ethic and Japanese religious and cultural traditions are employed to create certain attitudes among today's Japanese managerial elite. Why do bankers need to pursue zazen? If you can make these connections on your own, you're on the road to understanding why Japan has become so successful economically in the last fifty years. Read Gordon, pp. 11-21. Don't get lost in the names and details early in the reading, which no doubt you will find confusing; instead, pay attention to the emergence of the national system of government. Keep track of the vocabulary of the Tokugawa "feudal" system, however: bakufu, shogun, daimyo, samurai. Those of you who are medieval history whizzes: how similar is Tokugawa Japan to the European feudalism you've studied? What explains the attitude toward foreigners of the era? Why did Japan gradually close its doors to foreigners between 1587 and 1639? What effects did this Tokugawa policy have? Who in Japanese society benefited? Who was hurt? What long-term changes did Japan undergo during Tokugawa rule? How do developments in the eightenth and nineteenth centuries put pressure on the traditional social and political order? What accounts for the rise of city life in the period? Read Gordon, pp. 22-34. While the Tokugawa Era is notable for its stability, where is there evidence of discontentment with the system? How were the newly-arrived Westerners a threat to Japanese society in 1853? How did the self-imposed period of isolation make it possible for Commodore Perry to "open" Japan in the mid-1800s? Recall the reading on China. How did the Chinese experience affect the decision to abandon the Tokugawa political/social structure? What internal conditions prompted the shift? Could the Meiji Restoration be described as a revolution? This exam will cover everything we've studied to date. Read "Answering Historical Identification Questions" and "Writing Essays on History Tests" before you begin studying. While you are taking the exam, I will assign topics, as well as the dates to be presented. You may bring an unmarked paperback dictionary into this and all other exams in the course, but you may not share it with anyone else. 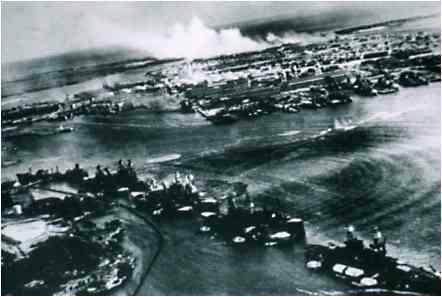 This captured Japanese photograph shows the December 7, 1941 attack on the U.S. naval base at Pearl Harbor. Read Gordon, pp. 61-75. Why was the Restoration so successful, given the very conservative tenor of the Tokugawa era? What were the goals of the Meiji leadership? Why was it necessary to abandon the traditional class system in pursuit of those goals? Remember the notion of island culture. Keep track of the various reform movements in your notebook. Read Gordon, pp. 76-92. What were the models for the new Meiji political system? How did the role of the emperor change? What advantages and disadvantages did the parliamentary system present? Do you see evidence of growing pains? Be sure you can document the growth of Japanese imperialism, as discussed in the last few pages of the chapter. In class, you will receive a handout outlining your responsibilities for an oral report covering some significant aspect of Japanese history in the World War II and Occupation eras. Read Gordon, pp. 93-112. Pay attention to the parallels between the industrial development of the early twentieth century and the postwar prosperity of the past forty years. What were the zaibatsu? Do they have modern-day equivalents in Japanese society? In America? Read Gordon, pp. 113-125 (top) and 135-137. In what ways could Japan's emergence as an industrial power be seen as setting the nation on a course for Pearl Harbor? Here it's particularly important to try to understand Japan's view of the world from a Japanese perspective. Ask me in class about the "Atticus Finch theory of history." Find three distinct ways in which Japan was made to feel inferior to its Western rivals in this time period. Read Gordon, pp. 161-180. What is the relationship between industrial development and empire? How are the forces of democracy thwarted in this period? We will continue our discussion of "the road to Pearl Harbor" in class. Read Gordon, pp. 181-201. If the road to war had its roots in 19th century, the war itself began in the early 1930s--well before most Americans were aware of another world war. How and why did the events in Manchuria accelerate the eventual conflict between Japan and the United States? What was the world reaction to Japan like throughout the 1930s? And how did the global economic crisis figure into all of this? 16. Japan at War I: Overview. Read Gordon, pp. 202-223. Why did Japan bomb Pearl Harbor? What was Tokyo's overall strategy in the Pacific War? Why did it ultimately fail? Keep track of the shifts in political power during the war. In class we'll begin oral reports on various aspects of World War II and Japanese society during wartime. Remember the time limits! Also, don't be trapped by the conventions of oral report delivery you learned back in Mrs. Goodheart's third grade class; you are being asked to play teacher for five minutes on a particular topic. How will you make the topic come alive for your classmates in a way that they will remember it in the future? Read Dower, pp. 3-32. In class, we'll continue with the oral presentations on the World War II era. You'll find the Dower reading challenging; this book is a monograph, rather than a text. At times, it will be a bit repetitive. But see if you can master the details of the author's argument. Read Henry Stimson, "Why We Dropped the Atomic Bomb," handout to be distributed in class. Shinjuku section of modern Tokyo. Read Gordon, pp. 224-241. To what extent does the American Occupation embody "political wisdom"? What was SCAP and what were its immediate priorities? Evaluate General MacArthur's effectiveness as chief architect of the Occupation. Can you explain why he was a proponent of what appears to be an ambitious program of social reform? How did the politics of the Cold War change American priorities in the Occupation? Can you identify the conditions and policies in the late 1940s and 1950s that lay the groundwork for Japan's phenomenal economic growth? Prepare a paper of 2-3 pages in length. The topic: why was World War II the formative experience for modern Japan? You may address the prewar or wartime eras identifying a thesis. You may want to consider general topics of race, racism, and propaganda as they relate to World War II. Your paper will be due at the beginning of class. No extensions granted, so plan carefully. We will discuss your papers in class. The ONLY acceptable ways to submit papers in this course is to enclose it as an e-mail attachment--PDF or Microsoft Word or a text file, please. Do NOT put your paper in one of my mailboxes or slip it under the door of my office or my office or apartment. If you need writing help, I have posted some useful information online here and here. 21. The "Economic Miracle" Begins. Read Gordon, pp. 243-267. Consider the role of the Japanese government in promoting commerce, finance, and industry; how is this different from what happens in the United States? Is there a different philosophy at work here? How is American helpful to Japanese economic growth? 22. Education in Japan I. Read Rohlen, pp. 11-44. Be sure you understand the different schools Rohlen studies. Are there parallels in American education at the secondary level? 23. Education in Japan II. Read Gordon, pp. 308-329. 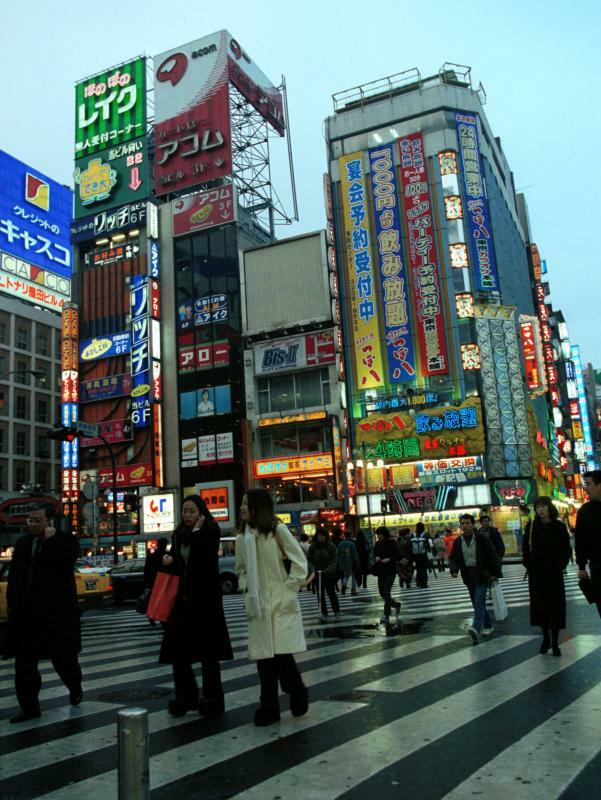 In class we'll wrap things up with an assessment of Japan since 2008 and a consideration of the nation's future prospects. We'll also take care of the course evaluations. Syllabus copyright � 1987-2018 Ned Gallagher. All rights reserved.